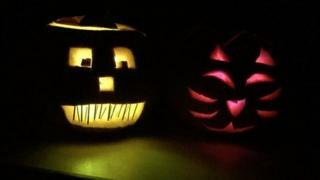 Image caption Richard Dackombe made these pumpkins with his children, using glow sticks and tea lights. It is that time of the year again where you put on your witchy costumes, knock on a few doors and eat lots of sweets. You have been sharing your Halloween preparations and tips for trick or treating with us. Here is a selection of your pictures and some of your advice. Emily took this picture of her five-month-old kitten Ivy. "She's hoping to get lots of treats," Emily said. Great pumpkin Charlie, but we think Samuel's is scarier. Jenny Powell sent in this picture of a ghoulish cloth creature trying its best to scare her daughters as they look on in mock horror. The creative talents of Alexandra Choa from Edinburgh, Scotland on display within this pumpkin. Jen Davidson carved the "small pretty pumpkin" while her children, Cameron and Kiera, carved the other two lanterns in this picture. Pictures of spooky face paintings in preparation for Halloween... we hope! We're pretty sure Amandeep Dhami's efforts could scare more than just the faint hearted. Meet Poppy the canine pumpkin in this photo by Valerie. Thanks for sharing your Halloween pictures and tips with us, and happy Halloween from everyone at BBC_HaveYourSay.